The frescoes in the Sacristy of the Toledo Cathedral. Toledo is an historic city in central Spain, located about 70km south of Madrid. 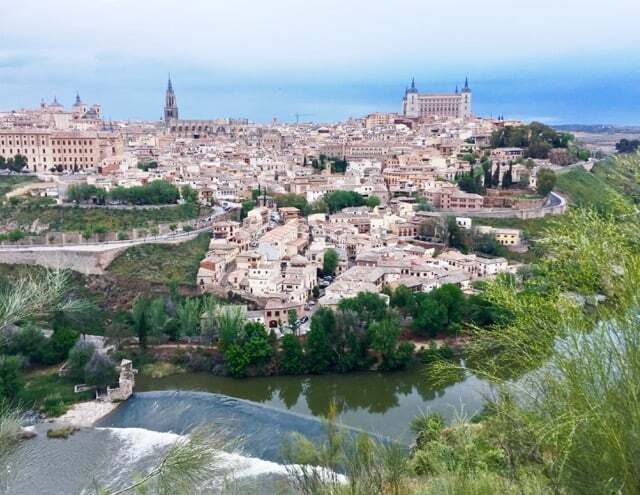 Its impressive history goes all the way back to Roman times and through the centuries, Toledo became a centre of commerce, law and literature for the Visigoths, and later under the rule of Arabs and Castilians. 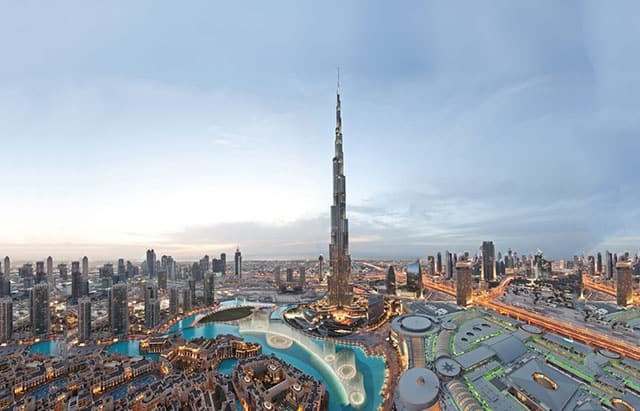 In 1986, the city was declared a UNESCO World Heritage site for its extensive cultural and monumental heritage and historical co-existence of Christian, Muslim and Jewish cultures. 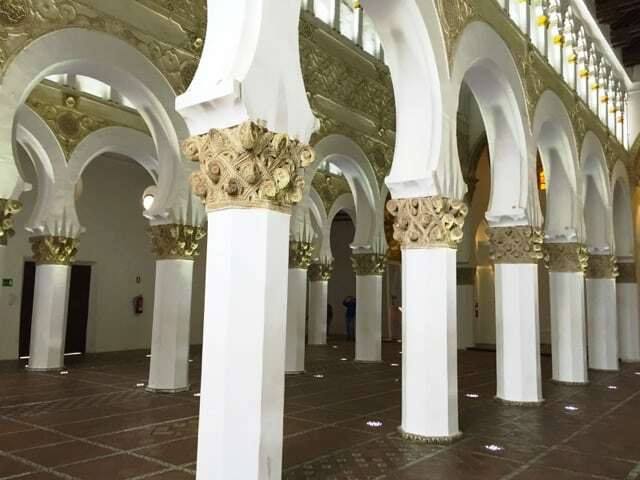 The legacy of these religions are very visible till this day, making Toledo a fascinating city to explore. 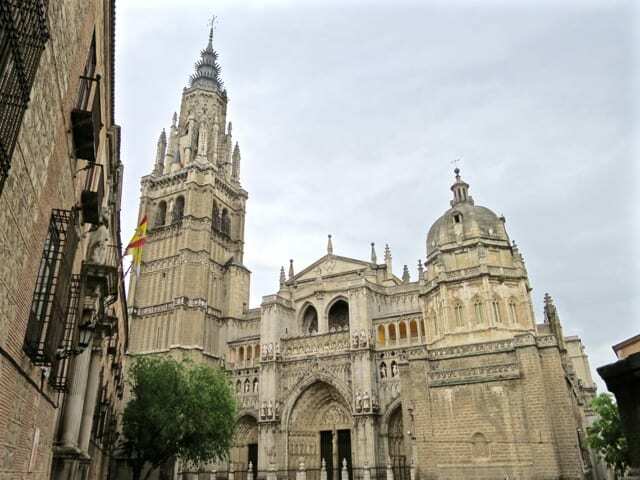 The Toledo Cathedral takes centre-stage and is a must-see for any visitor, but a stroll around Toledo to discover the city’s other historic gems and is absolutely rewarding! 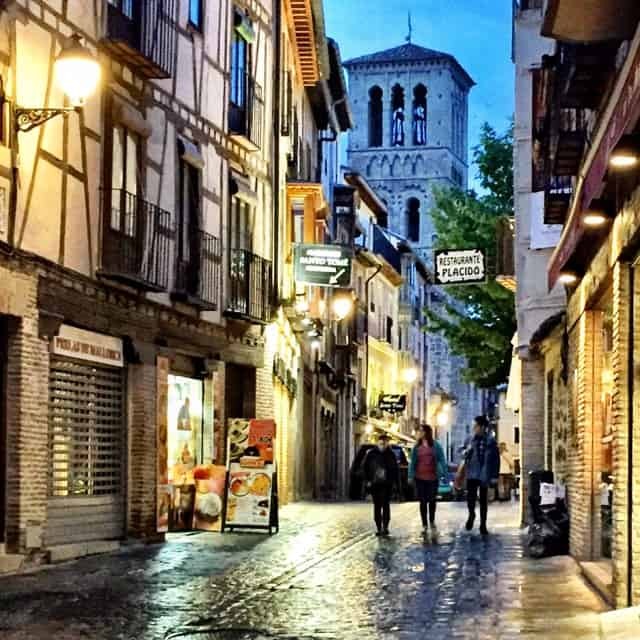 I highly recommend spending a night or more; there are so many things to do in Toledo, and wandering its cobblestone streets and lanes in the evenings, when all the day-trippers have gone, is a magical experience. It’s the biggest attraction in Toledo and justifiably so! 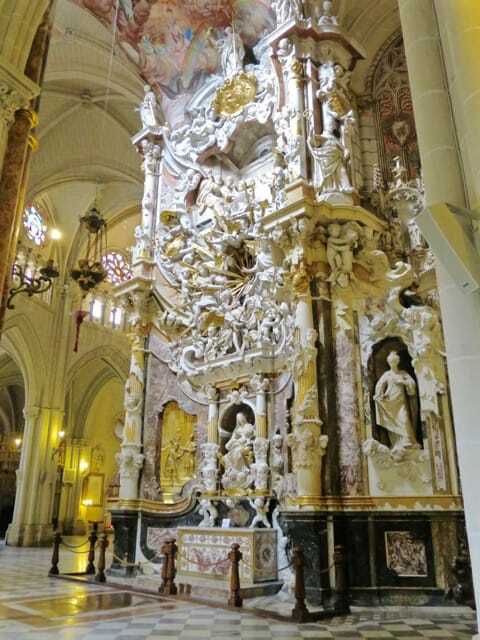 The 13th century Toledo Cathedral is one of the most important Gothic structures in Europe and houses a spectacular baroque high altar, the famous El Transparante altar and paintings by El Greco. A visit to the Cathedral is absolutely the top thing to do in Toledo! Aside from the Cathedral, other must-see historic monuments include the Synagogue of El Transito (a striking 14th century synagogue and museum), the Santa Cruz Museum, Museo del Greco (a museum dedicated to the life and works of the famous artist, El Greco), the beautiful Gothic-style Monastery of San Juan de los Reyes (with its gorgeous cloisters), the Mosque of Cristo de la Luz, the Santa Maria la Blanca Synagogue and the grand Puente de San Martin bridge. If you’re interested in Roman architecture, visit the ancient Roman Baths, the Alcantara Bridge and the old city walls (as well as the Roman Circus), and find traces of the old Roman system of aqueducts (the Hercules Cave is one spot). 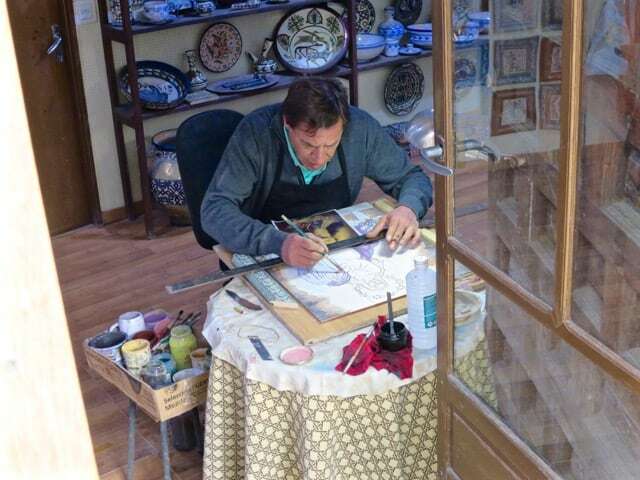 Toledo is a centre for arts and crafts. You’ll find many antique and craft shops as you stroll around the town. Look out for its ceramics (with gorgeous Arab-influenced motifs), Damascene ware (black steel with gold inlays, usually jewellery, medicine boxes, swords and plates), religious and medieval artefacts and if you’re a cook, look for the Toledo Steel knives (famed for its high-quality alloy)! 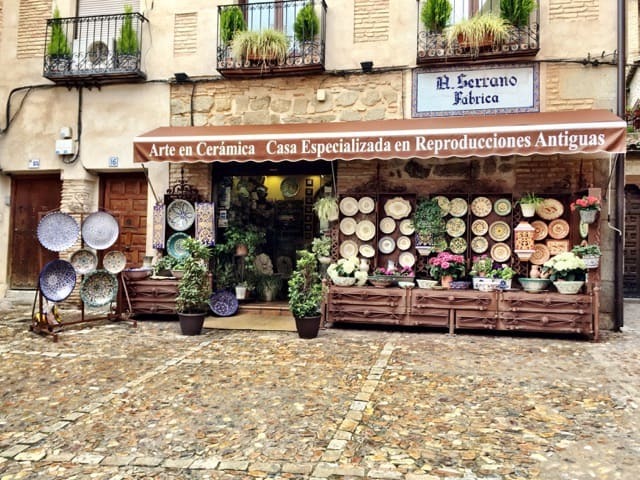 One of the many ceramics shops in Toledo. 4. Give yourself a culinary treat! If you’re a foodie, you’ll LOVE Toledo! Even in such a small town, I found a surprising array of food options, from the little bakeries and marzipan stores to cosy tapas joints and excellent fine-dining options. It’s no surprise that Toledo was selected as Spain’s Capital of Gastronomy in 2016. One thing that really blew me away was the incredible value-for-money at the high end. For instance, I had a terrific 8-course dinner at Locum, a beautiful restaurant located in a historic building, for just over €40! 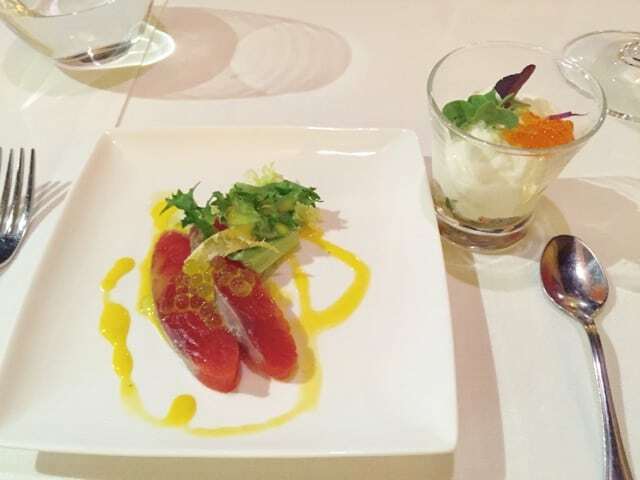 Tuna with a saffron sauce and olive oil caviar (spherified extra virgin olive oil, made to resemble fish eggs!) at Locum. I also had the great pleasure of tucking into an exquisite 7-course meal at El Carmen de Montesión, a one-star Michelin restaurant just outside Toledo. They have menus starting from €27.50 (this includes local wines and mineral water)! 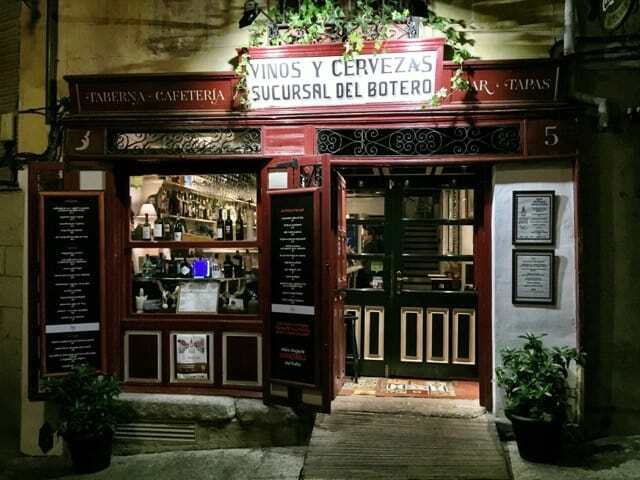 Typical dishes to look out for in Toledo include ciervo en salsa (venison stew), partridge stew, queso de overjaor (aged sheep’s milk cheese) and carcamusas (slow-cooked pork stew served in a clay dish). Toledo is a popular town for tourists but many of them are day-trippers. 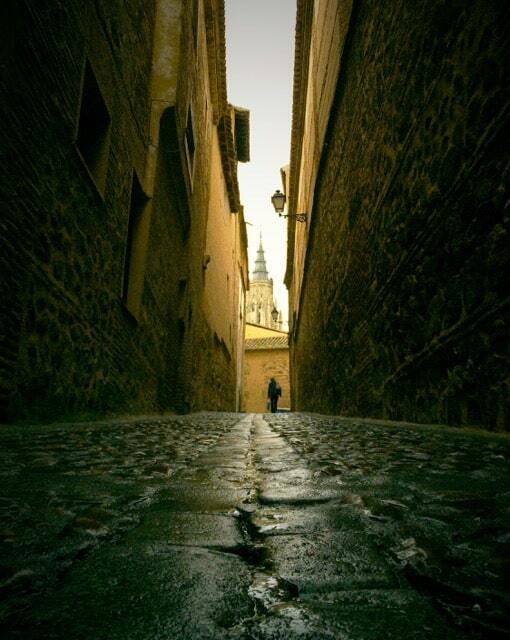 Strolling around Toledo in the evenings once the hordes of tourists have left is an enchanting experience. The soft glow of the street lights, picturesque cobblestone streets, centuries-old buildings, cosy restaurants and lively cafés create an irresistibly romantic ambiance. It was one of my favourite things to do in Toledo! Gorgeous cobblestone lanes in Toledo. 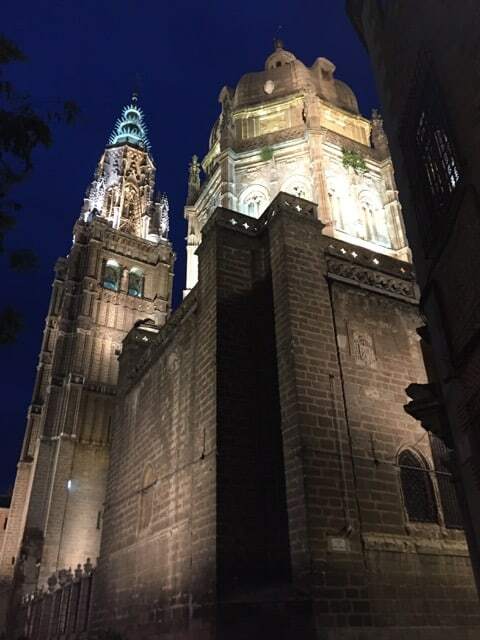 The Toledo cathedral is beautifully lit in the evenings. Pop into a wine bar and mingle with the locals. Our hilarious marzipan cooking instructor. If you’re a fan of marzipan, head straight to the Mazapanes Santo Tomé shop on Calle Santo Tomé. It’s an incredible sight and you can’t miss it! Another highly-regarded shop is Jacinta & Maria Chocolates in Calle de Santa Fe. A fun thing to do is join a marzipan cooking course. The course is presented in the building above the ancient Cuevas de Hercules (Hercules Cave – which you can also visit). I’m not sure if it was the wine, the hilarious lady who taught the course or the sugary marzipan but it was one of the most entertaining (and funniest) cooking courses I’ve ever had! Inquire at the Cuevas de Hercules (Callejón de San Gines, 3) for information about the course. You can’t leave Toledo without seeing the amazing panoramic view from the hills opposite the old town. Head to Mirador del Valle for a stunning view of the Tagus River curling its way around Toledo, with the iconic Cathedral and Alcazar as crowns on the cityscape. A panoramic view of Toledo. 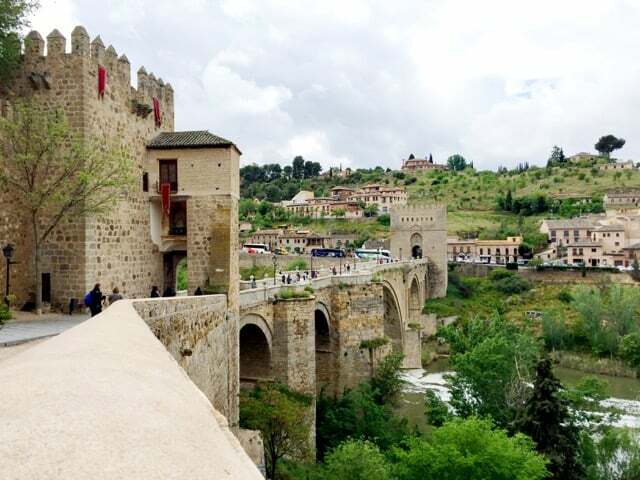 Toledo is easily accessible from Madrid by high-speed train (a quick 30-minute journey). Visit Toledo Tourism for more info. 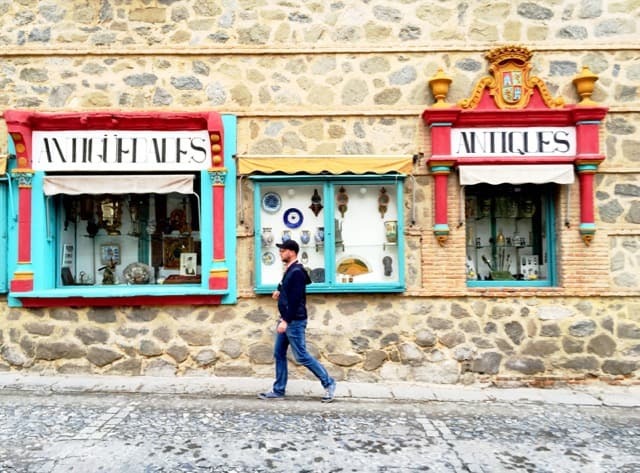 Note: my trip to Toledo was part of the #inLaMancha blogger project, a collaboration between iambassador and the Spain National Tourist Board. As always, all views expressed above are mine, and mine only. Thank you so much for contributing this tip! You sure live in a stunning city! Hi guys, My name is Leo and I’m from Toledo. I strongly recommend you to go by train (AVE from Atocha central rail station in Madrid) It is fast and very comfortable. If you buy return ticket you will save money (total costs arond 20 Euros) if you are not able to afford it bus is the cheapest way (around 10 Euros). Toledo is an easy, 25min. train ride from Madrid (Etocha station) so I hope you’ll get the chance to visit. It’s such a beautiful city! There are many ways to get from the airport to Madrid: metro, bus or taxi. Taxi would be fastest I guess. From Madrid, you can get to Toledo by train from Etocha station in just 25 minutes. Such a nice article about Toledo! I’m planning a few days trip around Madrid, and friends told me that Toledo is really close, so one day could be there… But what I dont know, what is the best way to get from the airport to madrid city centre? I don’t want to lose much time of travelling and getting lost… How are the taxis? And the transfers? Is the public transport easy enough? Thank you a lot! 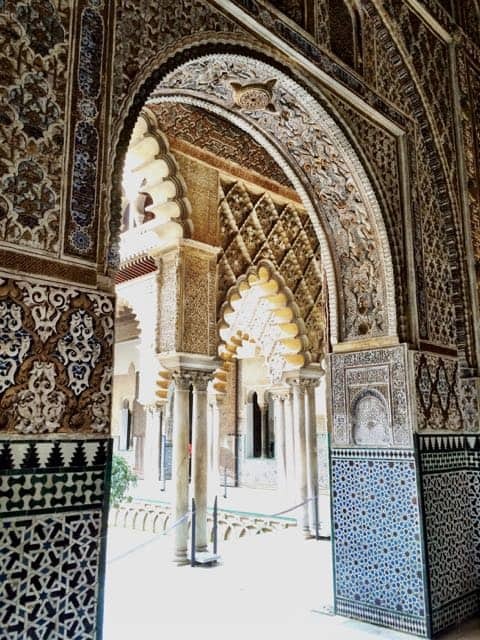 What a cool spot … I’ll definitely slot it in on my itinerary when I get to Spain next year! 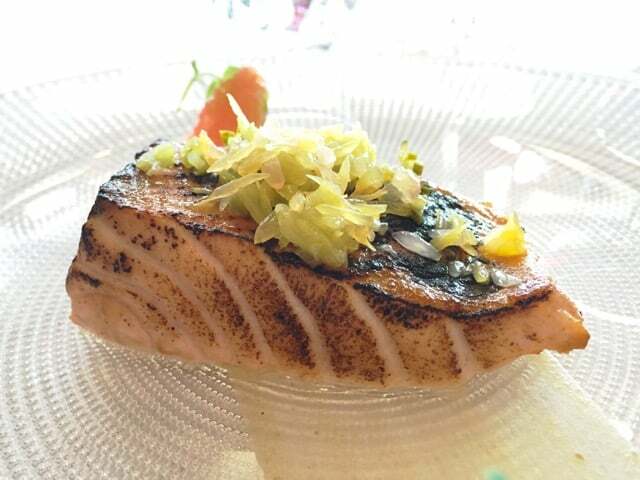 Great pictures – the food looks amazing !! I have a friend from Toledo, but never went there myself. But you definitely make me want to go there – soon !